IITA initiated the aeroponics system (AS) in February 2013 as one of the high ratio propagation technologies for seed yam tuber production. 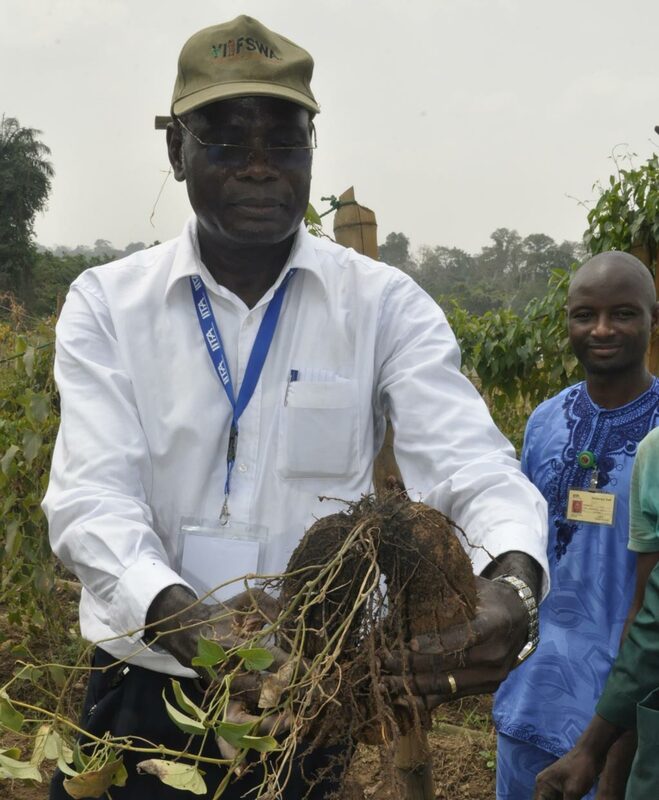 After nearly three years of experimentation, it was discovered that the AS can generate three types of planting materials for seed yam propagation. These are the mini yam tubers harvested in AS boxes, the aerial tubers known as bulbils in both water yam and white yam varieties, and vine cuttings. 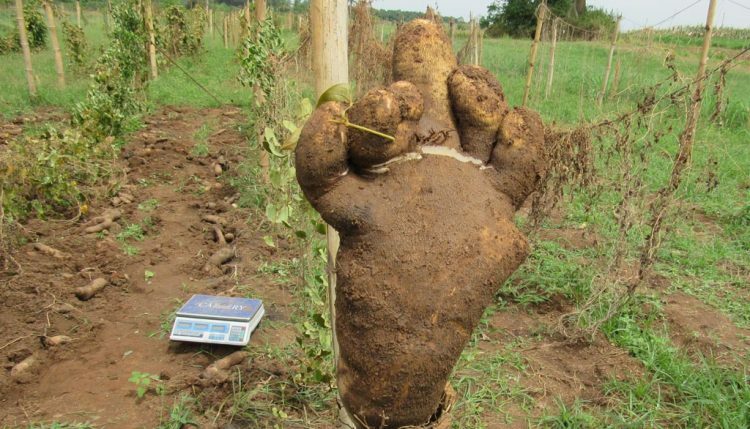 One ware yam tuber from plant issue of one node vine cutting weighing 3.2 kg with the shape of a human foot. On average three tubers are harvested per plant on AS every 3 to 4 months. The water yam varieties were more prolific (up to 150 per plant) than the white yam (30 per plant for some varieties) in bulbil production. The abundant development of canopy in temporary immersion bioreactor (TIB) yam plants grown in AS has prompted the testing of rooting of vine cuttings. The results of these tests conducted in June and July 2015 showed that at 4 weeks almost all the vine cuttings planted in nursery bags had successfully rooted (98%) and more than 95% of the rooted vines had developed new shoots and grown into normal plants with new leaves. Two ware yam tubers of over 1 kg each harvested from one plant of one node vine cutting. These results have reoriented the AS experimentation to production of one node vine cuttings. In fact the number of vines per plant is very high as the plants continued to grow and the vine cutting induces a speedy recovery of the canopy. The number of one node vine cuttings averaged 300 per plant in AS and turned out to have the highest propagation ratio among all the planting materials. From June to October 2015 we generated a total of 13,148 one node vine cuttings from eight varieties (5 Dioscorea rotundata and 3 D. alata). The one node vine cutting plantlets were transplanted to the field under irrigation between August and November 2015. Variety TDr 95/19177 transplanted in August was harvested in February 2016. A total of 262 tubers were harvested on 45 m 2 , weighing 109.9 kg in total and corresponding to 24.4 t/ha. 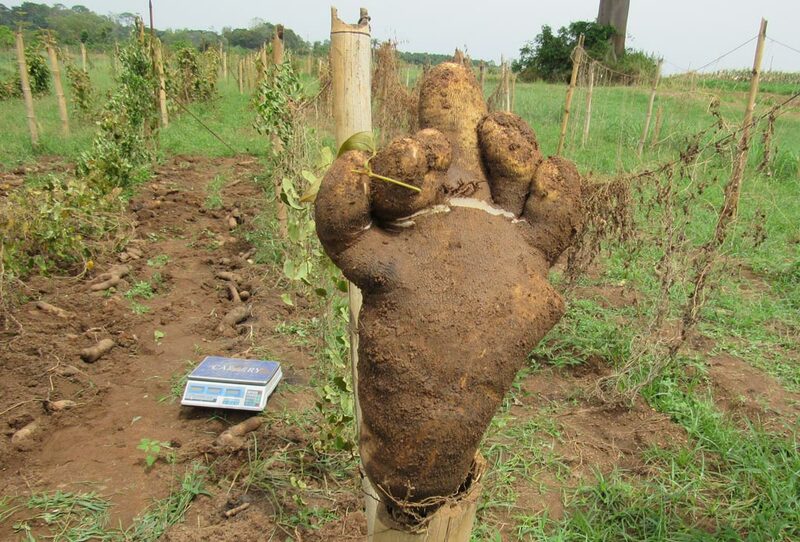 Eighty six percent of the tubers harvested, ranging from 41g to 999 g, are considered as yam tubers with an average of 358 g. Only 19 tubers representing 7% of the total tubers and weighing 28.93 kg are ware yam tubers ranging from 1.03 kg to 3.20 kg with an average of over 1.5 kg. The mini tubers represent 7% with an average weight of 24 g.
This good field performance of one node vine cuttings in a 6-month period is attributed to the use of virus-free TIB plantlets directly planted in AS. The majority (86%) of the seed yam tubers harvested from these one node vine cuttings weighed an average of 358 g which is much higher than the 150 g size recommended for seed yam tubers.